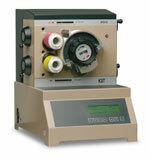 The IGT AE Four is the modern successor of the renowned IGT AE inking unit. The IGT AE Four is used to apply ink films of reproducible and constant layer thickness on to the printing discs for IGT printability testers. It is possible to distribute up to four different inks at the same time. These discs can be used on the IGT printability testers AIC2-5 and all versions of the IGT Global Standard Testers as well as the A1-3 and A2-3 types (with use of an adapter). The AE Inking Unit was developed for users looking for an uncomplicated way to conduct inking under controlled conditions. The IGT AE Inking Unit is a slow running inking unit which can be used to ink a maximum of 4 printing discs simultaneously. The technical design of this inking unit enables the user to make a large number of prints without adding ink or pick test oil and without heating up the device significantly and without influence of misting. The K Control Coater is widely used for theapplication of paints, varnishes, adhesives,liquid printing inks and many other surfacecoatings to produce quick, accurate andrepeatable samples. These may then beused for quality control and presentationpurposes, R&D, computer colour matchingdata etc. These are elements vital to acompany’s success in the modern world. The K Hand Coater provides a simplebut effective means of applyingpaints, printing inks, lacquers,adhesives and other surface coatingsonto many substrates includingpaper, board, plastic films, foils,metal plates, glass plates, wood etc. Two or more coatings can be appliedside-by-side in a single operationmaking the system ideal forcomparing products. K Lox Hand Unit The simplest method of applying flexoinks and other fluid coatings onto anysubstrate to produce accurate andrepeatable proofs that closely resemble conventional flexo printing. The K LoxProofer is an essential tool for ink makersand printers alike. Ideal for qualitycontrol and presentation samples, R&Dand computer colour matching data. The K Control Coater is widely used for theapplication of paints, varnishes, adhesives, liquid printing inks and many other surfacecoatings to produce quick, accurate andrepeatable samples. These may then beused for quality control and presentationpurposes, R&D, computer colour matchingdata etc. These are elements vital to acompany’s success in the modern world. High quality proofs using gravure, gravure-offset or flexo inks are produced instantly using the K Printing Proofer. Featuringelectronically engraved printing plates and variable printingspeeds of up to 40m/min, this is an essential tool for all thoseinvolved in the manufacturing or use of liquid inks. Ideal for R &D and computer colour matching data, quality control andpresentation samples. 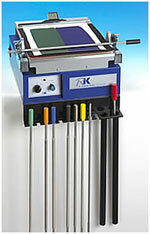 The K Printing Proofer is very easy to cleanand all parts are solvent resistant.